In this June 12, 2010 talk at TEDx Houston Mark Johnson touches on a number of issues related to sustainable housing with insight and humor. Commenting on the number of Tuscan and French Provencal mini-mansions popping up in Houston he shares his dream of someday traveling through France and seeing buildings based on the style Houston ice houses. He observes the absurdity of showing the strength and permanence of a building by using brick (but only for 25% of the house) and decorative shutters which not only have no hinges but which are too small to cover the windows to which they are adjacent. In his wide ranging talk he says that he thinks that people who build should be more concerned with impressing their children than their neighbors and friends and advocates for a slow home movement for housing similar to the slow food movement. Finally he points to the Beer Can House as an building of unique style made possible by Houston's loose architectural design control. Mark Johnson operates Hometa.com, a source for stock modernist home plans. 1. Bring 1 cup water to a boil with cinnamon stick and the intact 1/4 onion in a small saucepan. Add the lentils, cover and lower the heat to low. Cook for 25 minutes. Discard the cinnamon and onion. Add 1/2 tsp of the salt and stir. 2. In a large saucepan, bring 3 quarts of water to a boil. Add the shells and 2 teaspoons of the salt and cook for 12 minutes; the shells will still be a little tacky. Drain and transfer to a baking sheet to cool. Untangle the shells to prevent sticking. 3. Meanwhile, in a large saucepan, heat the oil over medium heat and add the carrot, celery, the minced 1/2 onion, and garlic. Stir and cook until softened, about 8 minutes. Add the wine and thyme, allowing the wine to reduce for about 2 minutes. Add the tomato puree and cayenne, stir to combine, and cook over low heat for 10 to 15 minutes. Add the lentils and cook for an additional 5 to 10 minutes. Add the reamining 1 teaspoon of salt and the black pepper, and taste, adding more as you see fit. Discard the thyme sprig, if using fresh. Stir in the spinach, turn off the heat, and cover. 4. Heat the oven to 350F. Ladle a small amount of ragout into a square or rectangular baking dish. Line up the shells in dish, then with a small spoon, fill each shell with the ragout. Top off the shells with a ladleful of ragout, followed by cheese, if using. Bake for 30 minutes. Virginia is now for lovers of family too. Tiny temporary houses for the infirm made legal . Accessory or secondary dwelling units are a way to increase the population density of suburban neighborhoods. With an increase in density public transit is more likely to be successful and businesses within walking distance have more potential customers. For these reasons and others advocates for sustainable development around the country are promoting government action to make small additional homes legal. In Virginia a special type of secondary dwelling unit has been made legal. HB 1307, "Zoning Provisions for Temporary Family Healthcare Structures," over rides local ordinances to allow a secondary dwelling unit to be temporarily placed on a property to provide a dwelling for an ill family member. The dwellings require a doctor's authorization and are to be removed when the medical need has passed. MedCottages (288 sq feet) are specifically designed for the infirm elderly. With remote monitoring, an overhead rail to allow easier transfer from bed to bathroom, roll in showers and HVAC which will allow either positive pressure to keep pollutants from entering the home or negative pressure to keep infectious agents from leaving the dwelling. The dwellings rent for upward of $2000 per month and are intended as an alternative to nursing home care. The video below is a bit lengthy but explains some of the ideas behind the MedCottage law and the inspiring story of its passage. This truly deluxe casserole is a snap to make and a hit with everyone who has tasted it. It blends the sweet taste of fresh corn, tangy roasted red peppers, rich sesame tahini, sweet squash and the nutritional kick of beans. Puree the beans with tahini and season lightly with shoyu. Set aside. Mix corn meal with salt and enough water to make a thick paste. You will need about 1 1/2 cups of this mixture. Fold in corn kernels. Set aside. Line a lightly oiled, deep casserole dish with several clean corn husks, allowing them to hang over the sides a bit. Begin layering (like lasagna) by spreading some corn meal mixture on the husks. Add some of the bean mixture, pureed squash and sprinkle with a bit of the red peppers. Continue layering until the dish is full, but be sure to end with corn meal on the top. Fold the husks over the casserole and press into the topping to hold them in place. Cover and bake at 375 degrees for 35 minutes, until firm. Remove the cover and return to oven to brown the top slightly. Serve immediately. From algae-based fuel substitutes to solar energy, finding new ways to reduce our carbon footprint comes forms. Numerous 21st-century findings are aimed at long-term viability for increased efficiency, as to contend with oil companies. For the moment however, who do we have looking into short-term energy challenges? Nevertheless, I think most would argue that these slowly declining numbers are part of an attempt to increase fuel efficiency through the direct use of technology. One particular means involves fleet route optimization. In a partnership with San Francisco, ESRI, and NAVTEQ, the CGI provides a pledge to add in plans to decrease greenhouse gas emissions from fleets in the San Francisco Bay Area through Fleet Route Optimization Software. Utilizing GIS mapping software, ESRI also helps the user interpret data, further aiding in transportation-based decision-making, reliant on the best information and analysis. Much of this is similar to what the average consumer finds on his/her portable GPS. Furthermore, it’s important to note that this technology has been around and is widely used. Both ESRI and NAVTEQ hope to provide powerful solutions for technology companies that enforce municipal transportation efforts. Once a seamless integration of communication and navigation has been implemented, transportation will become much more efficient. Again, this is something that has already taken effect and will continue to improve energy efficiency in regards to transportation fuel costs. As we technology progresses and becomes more affordable, individual consumers will begin seeing GPS as longer just an option, but rather a integral part of any vehicle. The Texas Drought Project presents populist author and radio host Jim Hightower along, with international experts on climate justice issues. Most will be attending the COP-16 Conference in Cancun later this year. Victor Menotti, Director of the International Forum on Globalization will headline a stellar panel, along with Genaro Lopez-Rendon of Southwest Workers' Union and Movement Generation. For detailed directions, see the link on the church website. The church is near the intersection of (North) IH 10 and Loop 410 and it has plenty of parking! Watch this Facebook page for more updates! We're asking $10 donation per person, but NO ONE will be turned away. The event will be live streamed according to a post on Facebook. 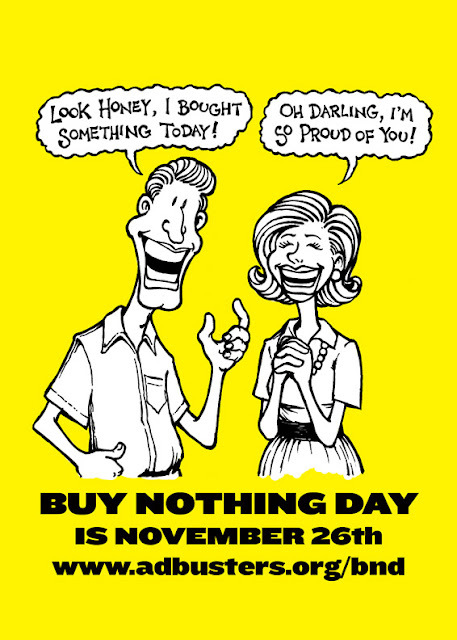 Buy NOTHING Day November 26, 2010 is coming! 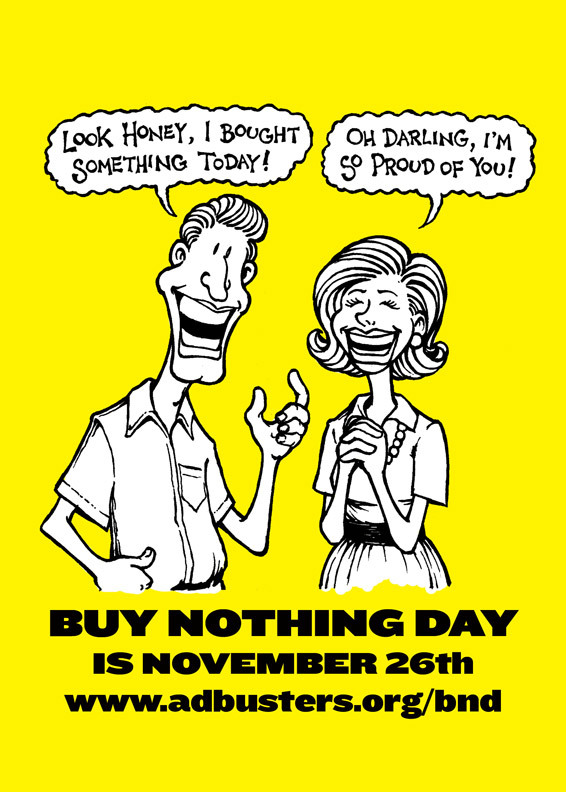 Will you be buying nothing?? 11 year old Birke Baehr's TEDx Ashville talk on "What's Wrong with our Food System"
I shared the video of Birke Baehr with various friends yesterday, and decided that it needs a wider audience! Birke is an extraordinary home-schooled child, 11 years old, ranting about what's wrong with our food system on TEDx(*) in Asheville, NC. It's a MUST-WATCH! In searching for more information I found a blog, OUR NATURAL LIFE: Provocative Discussions About Leading A Holistic, Sustainable, and Healthy Life, that featured Birke and how he inspired his own family. "As this 11 yr. old's mother I can assure you Birke plays outside more than most kids and he doesn't sit in front a computer 24/7. He also reads more than just about organic foods -- he is quite the historian, knows aï»¿ lot about geography, sports and other subjects. His 'soul' is quite intact and isn't lost or pitiful. He has a mind of his own and is curious about the world around him and is allowed the freedom to follow his interests. He is also much better at spelling than you are." Created in the spirit of the TED.conference mission, "ideas worth spreading," the TEDx program is designed to give communities, organizations and individuals the opportunity to stimulate dialogue through TED-like experiences at the local level. TEDx events are fully planned and coordinated independently, on a community-by-community basis. 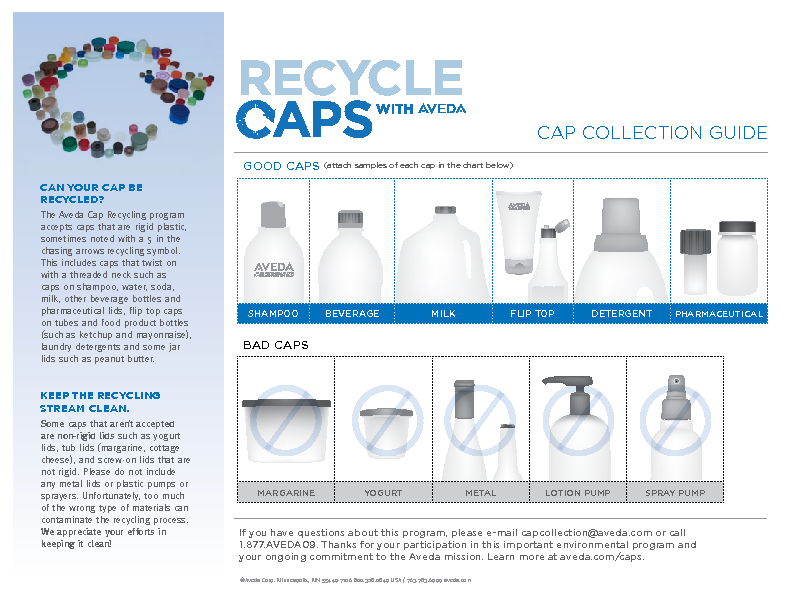 Caps not accepted in San Antonio recycling, but Aveda will help schools collect and recycle many of the plastic ones. Many recycling programs do not accept caps to the recyclable jars and containers that they do accept. In San Antonio we're not to include any sort of cap in "Blue is the New Green" recycling carts. Aveda, the salon products company has a program that will accept many of the plastic caps. It is administered through schools. They can't accept metal caps of any kind or caps with pumps but they do accept caps that twist on with a threaded neck such as caps on shampoo, water, soda, milk and other beverage bottles and pharmaceutical lids, flip top caps on tubes and food product bottles (such as ketchup and mayonnaise), laundry detergents and some jar lids such as peanut butter. Students and parents collect the lids then they are placed in prepaid UPS shipping boxes. Aveda pays for the shipping. For more information on how to sign up a school Aveda has separate pdf for parents and for teachers. I haven't found a list of participating schools though I understand that the Aveda salons and the Aveda Institute in San Antonio also accept the caps as does Whole Foods. Hydrocarbon wells can generate electricity. Using the waste fluids from hydrocarbon wells, owners can now generate electricity for their pumping needs, with any additional electricity sold to utilities as renewable energy. A small binary electric turbine (250 kW+) is attached between the separation stage and re-injection well. This can be done on one well or multiple wells with temperatures over 225°F and 200+ gpm of combined fluid. Thus waste fluids become a valuable commodity! The amount of electricity is dependent on input and cooling temperatures and fluid flow rate. 1) In Texas there is now an exemption from oil and gas Severance Taxes for oil and gas co-produced with geothermal energy. 8) Renewable Energy Credits (RECS) are an additional commodity that the Hydrocarbon lndustry can use or sell .... It’s GREEN POWER! 11) Government grants and loans may be available to develop new systems for demonstration sites. Thus revenue from a binary turbine installed to produce 225 kWh/yr is approximately $200,000 and 500 kWh/y generates approximately $368,000 in revenue. Approximate estimated installation costs $500,000 - $1,500,000 for 250 to 500 kW plant. In light of Wold Vegan Day (yesterday). I found this recipe to help bring in the Fall weather. Great as a side dish and with little tweeking, made Vegan! Adapted from Comfort Food (Taunton Press, 2004). Hurray for the nutty sweetness and deep nourishment we get from roasted harvest squashes! This ultra-simple recipe practically makes itself, and the results embody all the colors, textures, and flavors of fall. A touch of butter and maple syrup is all it takes to turn this dish into a masterpiece (or you can add optional fresh ginger and pecans to really gild the lily). Anti-oxidants, minerals, and true fall taste: Maple-Roasted Acorn Squash has it all. 1. Preheat oven to 400F. Slice a thin piece off both ends of the squash, including the stem. Cut the squash in half crosswise (perpendicular to the ribs). Scoop out the seeds with a sturdy spoon. 2. Line a pan in which the squash can fit snugly with foil or parchment paper. If you use foil, rub with butter to prevent squash from sticking. 3. Set the squash halves in the prepared baking pan and smear the flesh with the softened butter. Sprinkle with the salt. Drizzle maple syrup over the cut edge of the squash and into the cavity (most of the liquid will pool there) and sprinkle with the ginger, if using. 4. Roast the squash halves until nicely browned and very tender when pierced with a fork, about 1 hour and 15 minutes for a small to medium squash (larger squash may take longer); add the pecans, if using, for the last 10 minutes of cooking. Do not undercook. Serve warm with a spoon.